I’ll admit that I haven’t been following Metallica that closely since 1991’s Black Album. A friend introduced me to the band’s music in the mid-80s, and initially I was repelled by their seemingly hyperbolic metal-head mien. But then I grew into their feisty brand of artsy cacophony and began to realize just how refined their music was, considering metal’s typical image as brutish amorphous noise. Instead, Metallica brought the music form to a sublimely primeval level. For the most part throughout its tenure as the reigning metal royals, Metallica has crafted albums of barely contained, eloquently wrought fury. Sure, the band evolved from a more sinister sound to a more palatable one over time, but native to that sound has always been anger sublimated through layered labyrinthian fretwork, graveyard-yowling vocals, and aggro percussion. St. Anger, according to many, was a pesky anomaly amid Metallica’s catalogue – a rumbling jumble of sounds and moods but lacking cohesive integrity. With Death Magnetic, Metallica re-establishes itself as the Zeus of the metal pantheon. 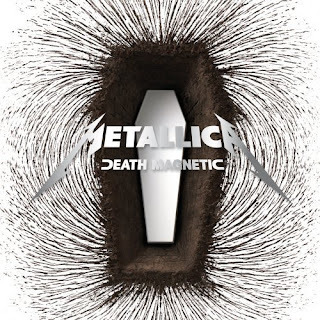 With structures that allow for some meandering but only within tightly constructed confines, thickly fortified guitars, Hetfield’s sensual growl, and darkly aching melodies, Death Magnetic is at once a return to and a departure from form. The difference between this album and, say, the Black Album, is that it has a more claustrophobic feel, and a more analytical aesthetic. The album has accessible elements but does not allow for much breathing space and is not terribly hook-conscious. It requires actual concentration to discern its many merits – it is studiously intricate, but in way that’s refreshingly free of pretense. The two stand-out tracks, “Show your Stars” and “The Day That Never Comes” showcase the fraternal twin personalities of Metallica’s sound – menacing melody and frenetic rage. The album displays an odd retro-progressive paradox in that in teems with allusions to its past, and yet boldly moves the Metallica sound forward – takes the signature weaving guitar solos into mazier territory, the typical muddy mixture of instruments and sharpens it for crisper clarity, and so on. Ultimately, Death Magnetic is an academic album, delving deeper into the Metallica lexicon in order to hone it and take it into new chapters. The textbook for producing a complex, abrasive, metal masterpiece is named Death Magnetic.